NaturallyKandiilicious: Beyonce Is Get'n Hers! ...Some would say yes, because they just love Beyonce! Well with all the lights, speakers, mics, amps that were hooked up for the halftime show I was not shocked that there was a power outage. However, what really shocked me was how long the outage lasted. Even with all that, I have to honestly say I wasnt overly impressed with the show! Don't get me wrong, I love me some Bey, her body was perfect, hair blowing, she had on a leather & lace onesie that looked painted on and her presence was surely felt. My boyfriend loved the visuals...what man doesnt?? I expected so much more, however she still did a good job. There is no way anyone can say that she was lip singing and regarding the performing area she nailed it. That Dutty Wine was everything! My only issue was her choice of songs. I am sure her including a mini Destiny Child's "reunion" played a part in why her recent songs were not played. Speaking of Destinys Child...Michelle was irrelevant to me but I love me some Kelly!! & Did you notice all her thickness?? Thats a discussion for another day!!... Beyonce closed out her show singing HALO which I didnt care to hear but she sang it so beautifully. All in all, I am just going to put it like this, I wouldnt have been mad if I missed her performing and had to watch it later. At the end of the day she still got that CHECK! and she is still the Queen B! 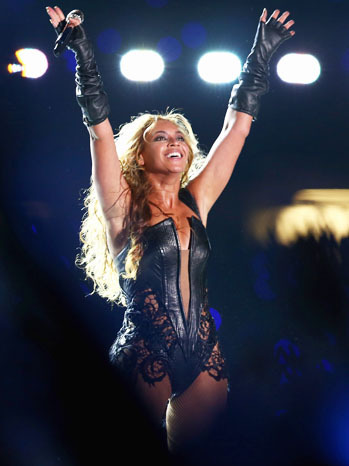 What did you think of Beyonce's performance??? Get It Right Get It Tight!